to and fro while shaking them, the geometrical limit of the shadow can be definitely marked to within something like half an inch; that is, a quantity of the same order as the length of the sound wave which is being used. 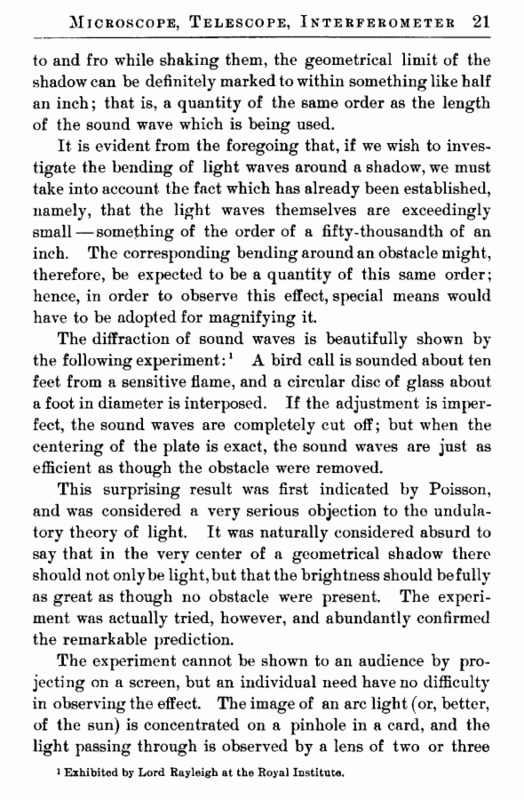 It is evident from the foregoing that, if we wish to investigate the bending of light waves around a shadow, we must take into account the fact which has already been established, namely, that the light waves themselves are exceedingly small — something of the order of a fifty-thousandth of an inch. The corresponding bending around an obstacle might, therefore, be expected to be a quantity of this same order; hence, in order to observe this effect, special means would have to be adopted for magnifying it. 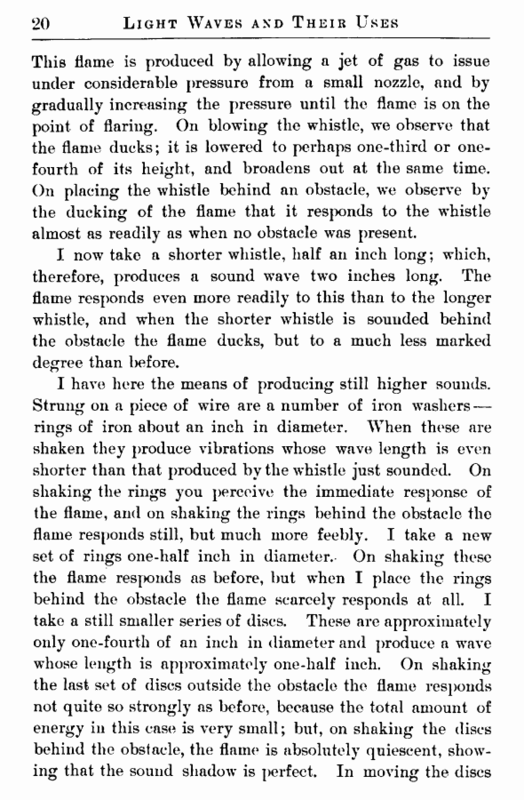 The diffraction of sound waves is beautifully shown by the following experiment:1 A bird call is sounded about ten feet from a sensitive flame, and a circular disc of glass about a foot in diameter is interposed. If the adjustment is imperfect, the sound waves are completely cut off; but when the centering of the plate is exact, the sound waves are just as efficient as though the obstacle were removed. This surprising result was first indicated by Poisson, and was considered a very serious objection to the undulatory theory of light. It was naturally considered absurd to say that in the very center of a geometrical shadow there should not only be light, but that the brightness should be fully as great as though no obstacle were present. The experiment was actually tried, however, and abundantly confirmed the remarkable prediction. l Exhibited by Lord Rayleigh at the Royal Institute.